Note: This is the final installment in a three-part series that describes a year in the life of a DWR fisheries biologist. I’M DRIVING HOME from work along Legacy Highway in Davis County. During my commute, I take a routine glance out the passenger side window to observe Bountiful Pond, a popular 50-acre community fishery just west of the highway. The ice, which recently capped, has finally given way and now only grips the south half of the pond. Just a few weeks ago, people were ice fishing for trout in the very spot where now, there is only open water. I think to myself, it’s time to finish those last few reports because the spring field season will be here before you know it. This means it won’t be long before my work routine will change from days behind a desk to days spent outside working on Utah’s waters. In the coming weeks, biologists (myself included) work quickly to hire seasonal help and dust off equipment before the next field season. We’ve actually been preparing for the change in seasons since February. These preparations began in the office, with meetings to prioritize and coordinate work to be done at Utah’s fisheries during the next year. At this time, we discuss the many fishery surveys, habitat improvements and restoration efforts that will be conducted. 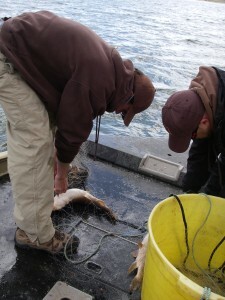 Biologist use gill nets, like this one, to catch fish, study them, and record the new data. There are always more waters to survey than there is time, so we have to carefully choose which waters will be monitored and how much time we will spend conducting work at each one. In addition to making plans, we also order new equipment needed for the upcoming work. Spring is an important time for fish and the biologists who study them. The change in season triggers a flurry of fish activity. Many of Utah’s fish species are spring spawners. In fact, species like arctic grayling and northern pike spawn almost as soon as the ice leaves the reservoir surface. Fish activity and feeding can also really heat up along reservoir shorelines in the spring. The sun warms the shallow areas of water first, and fish naturally move into this water to bask and feed. The resulting activity attracts anglers and fishery biologists, both with the same goal: to catch a lot of fish. While the angler is looking to catch fish in the shallows for enjoyment, I take advantage of these spring fish movements to maximize how efficiently I work, capturing a large sample of fish to examine, using minimal effort. The fish I target this time of year are usually trout. I’m looking to see, not only what the population is like, but also how well the fish stocked the previous season are fairing. How many fish stocked the previous year are present in the nets? What different sizes of fish are present? How skinny or plump are the fish? These types of questions are important because, for example, if many fish are relatively skinny, it means we may want to reduce the number we stock so that there is less competition among fish for food. 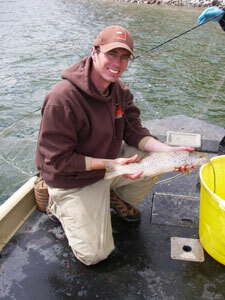 Spring triggers a flurry of fish activity, making it easier for biologists to capture fish and examine them. The gear I use to capture fish in the spring is called a gill net. Gill nets are simply long, specialized nets made of monofilament nylon—the same stuff fishing line is made from. Because it’s difficult for fish to see the monofilament nylon in water, they often swim right into the net where they become tangled and wedged. These nets measure about 80 feet long and six feet high and are usually set perpendicular to shore (check out this illustration for reference). What makes them special is their multi-panel design, each panel with a different size of mesh. The varying mesh sizes allow biologists to catch fish in a variety of sizes. I usually set these nets up on a reservoir in the afternoon, and empty them first thing the next morning. Bringing a net up to the surface after letting it sit overnight is always exciting because you never know how many fish are waiting for you. Sometimes a net doesn’t catch any fish, while other times, it’s so full it takes two people to pull it out of the water. Most of the time, though, it’s somewhere between those two extremes. It’s easiest to work with at least one other person when emptying nets—that way one person can pull the net while the other stacks it away neatly for future use. It also helps to have someone measuring the fish while the other records data. This year, I’ll be setting nets at East Canyon, Hyrum, Lost Creek and Rockport Reservoirs. Orange buoys mark the nets so that they can be easily located. The orange also lets boaters know to avoid what’s below. So, in the spring, if you see two buoys set perpendicular to the shore on one of your favorite waters, you may be looking at a gill net that’s helping biologists fish for answers hidden beneath the surface.